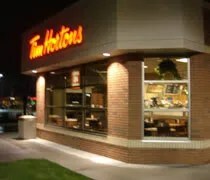 I never really think of Tim Hortons as a place to get a quick after dinner snack, but Monday night I was watching my favorite CBS show, How I Met Your Mother, and one of the characters actually threw out a Tim Hortons reference. The character, Robin, is from Canada which is where Tim Hortons was founded. She said something to the effect of ‘at least I didn’t say let’s go to Tim Hortons.’ Six months ago, I wouldn’t have had the slightest idea what she was talking about becuase there were no Tim Hortons in Illinois. We found them for the first time when we moved to Lansing. LANSING, Mich., October 15, 2008 – East-Lansing based BIGGBY COFFEE will open a new location in its hometown of Lansing on Tuesday, Oct 21st, across from Eastwood Town Center. The new store, located at 2250 Lake Lansing Road, marks the 24th greater Lansing location for the increasingly popular coffee retailer. The store is open 6 a.m. – 9 p.m., Monday through Saturday, and 7 a.m. – 9 p.m. on Sundays. Soft seating and free wireless access will be paired with a fun, inviting atmosphere—all standard options at BIGGBY COFFEE.